After a great night of sleep with the heat on full blast we were ready to head back out into the cold. Kris drove us back to where he had found us, then along the road we had walked up down to the border wall so we wouldn’t have to rehike any miles. We had to open a cattle gate to let him through and we were convinced Border Patrol would come flying over at the sight of us. But we saw no one and Kris dropped us off without incident. We hiked for less than 5 minutes before Border Patrol drove up from behind. A guy who was all smiles checked in with us. We had some questions for him about whether or not we could hike along the wall. And could Kris drive in to pick us up on a road ahead? He knew who we were, apparently he had just run into Kris driving out who had told him about us and asked the exact same questions. They had seen us coming as we expected but took longer to get to us than we anticipated. 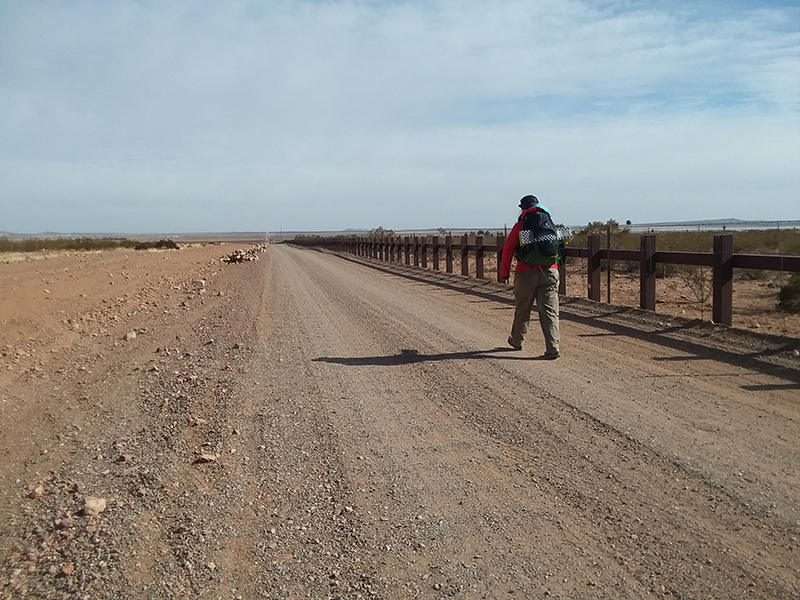 The agent told us that all the roads out here were public, including the one running along the border, and we would be fine to walk or drive along them. Although it was unusual for anyone to be out here so we should let Border Patrol know before we came out. We opened one of the many cattle gates that partition this section of the border road so he could stay in his truck and pass through. 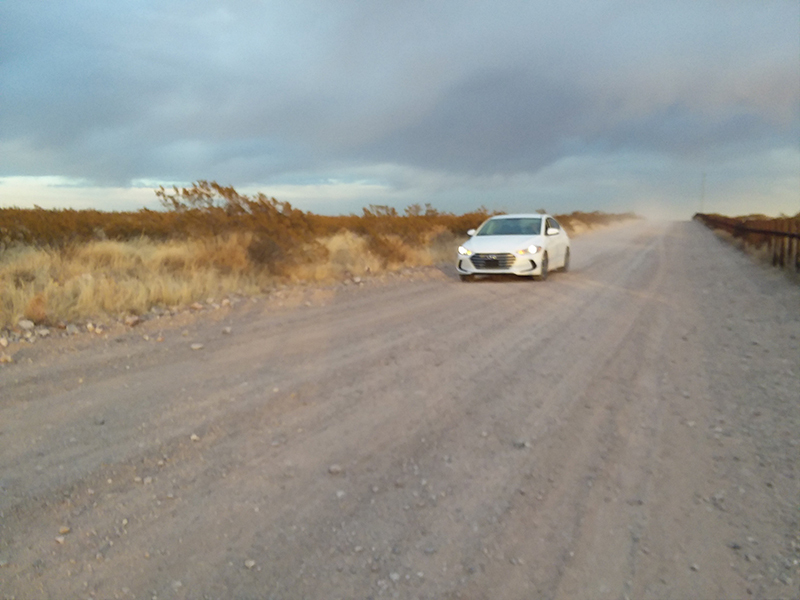 A couple miles further four more Border Patrol vehicles were congregated around a construction site. One had his lights on flashing red and blue, and several men stood around the vehicles. This section of border road is extremely well maintained. We assumed as usual, for BP? It’s two vehicles wide and flat without a single pothole. Yesterday, when we mentioned huddling out of the wind in a ditch, we were talking about an extremely well crafted ditch, with water diversions and careful stone work. Every half mile of wall is marked by a 15 ft dark blue sign with large neon yellow numbers indicating the zone. Another break in a ditch hiding from the cold, another pass with an expansive view of our future. The oppressive and gloomy clouds had parted letting in a cheerful ray of sun, and green and brown crops spread out ahead. Tenny asked: what does this view make you feel? We’ve seen a lot views on this trip: enormous flat valleys full of organized agricultural lands with rugged mountains in the distance. Claire mentioned that it felt familiar and Tenny agreed, it’s almost comforting. This feeling lasted only briefly, once again the clouds crowded back over the sun and our anxieties returned too. Here, the border is a rusted steel fence. Over on the Mexico side was a town in ruins, buildings slumped, adobe brick walls half torn down, homes without roofs, and street lights with no electric line. 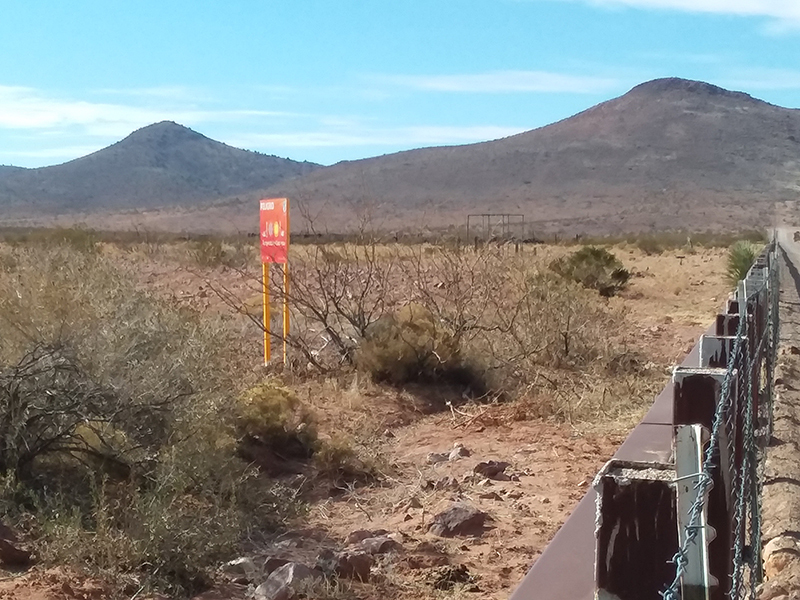 There was no sign of life until a truck flew by out of nowhere, speeding along a road we belatedly noticed running directly along the Mexican side of the border. A large sign edged the road, facing away from us, and we craned across the wall to try and see what it said. It was bright orange and warned about extreme temperatures and limited water in this area. We weren't sure if the sign had been erected by Mexican authorities or BP had put it up to discourage crossings? Tufts of cotton lingered around the edges of a farm, only plant stumps remained scattered about the field. Cotton fields are common enough here and this one must have been recently harvested. Mounds of mulch piled up to the side. Onions lay discarded among the nutrient mix, some had resprouted, some still decomposing. The cotton fields weren’t just limited to our side but grew in Mexico too; it’s been rare to see the same production on both sides. Perfect rectangular bales of cotton sat ready 20 feet to either side of the wall, creating an efficient system for future handling and transportation. We watched a grey and black cat weave in and out of the border wall. The cat seemed to enjoy rubbing up against the posts and wandering from the States back to Mexico, then the States again. Cat. Gato. Cat. Gato. On the Mexican side, pickup trucks flew by at speeds way too fast for the road’s condition. Each one seemed on the brink of catastrophe. The same red truck passed three times and then slowed down to catcall us as it went by. Ugh. We want to be friendly out here but there’s a limit. Another truck bounced along with a young cow in the back, its legs braced against the bumpy ride. Hopefully it’s not headed directly to it’s slaughtering. Right as we wondered aloud where Kris was, we heard the sound of his car in the distance. As he crested the hill we felt inspired to dance a little jig. It’s our last night with him and it’s going to be extremely difficult to say goodbye. Not only does his logistical support make the hiking easier, but his energy and humor make life infinitely more enjoyable. We packed in the car and headed back to town, once again avoiding Border Patrol who weren’t able to get there in time to ask who we were.